Sharp bend to the left ahead. Steep decline ahead to the left. 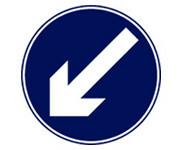 Explantion: This sign tells you that you must keep left. It is usually displayed at a traffic island in the centre of the road.